It’s twenty-five years since I was received into full communion with the Catholic Church. In some ways it seems like an aeon ago. In other ways it seems like yesterday. It’s a quarter-century now, but I still experience, every February, a certain sense of homecoming. On February 22, the Church celebrates the feast of the Chair of St. Peter, Apostle. It’s an ancient feast, originally marking the first time the Prince of Apostles celebrated Mass with his Roman flock. Today, we continue the tradition of our Fathers, and we celebrate the office of St. Peter’s successors as well. We celebrate the papacy. We have good reasons to celebrate. Peter’s Chair is a point of unity for us. It is a haven of safety. We have the guarantee of divinity on the matter. Jesus said to Simon: “And I tell you, you are Peter, and on this rock I will build my church, and the powers of death shall not prevail against it. I will give you the keys of the kingdom of heaven, and whatever you bind on earth shall be bound in heaven, and whatever you loose on earth shall be loosed in heaven” (Matthew 16:18-19). If you’ve read my book Reasons to Believe, you know how excited I can get when I talk about this subject. If you haven’t read that book, please do! Skip ahead to chapter nine to celebrate the feast with me. There I try to answer, in a summary way, the various “biblical” objections that non-Catholics raise against the papacy. This year we at the St. Paul Center will have ample reasons to celebrate. The Gospel readings at Mass in 2011 are mostly drawn from Matthew, the Gospel where we find key texts that describe Jesus’ establishment of the papacy. We’re emphasizing Matthew at our conferences and events through the year. But, more than that, we’re making the acts of devotion that St. Matthew leads us to make. In May we’re going to the Holy Land, where we’ll stand on the site where Jesus commissioned Peter with the keys. We’ll look at the formidable rock that loomed in the background of the Gospel scene — and stand ever more firmly on our papal, Catholic ground! 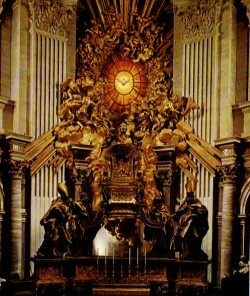 In November we’ll sponsor a pilgrimage to the very Chair of Peter, in Rome. I hope you’ll be able to join us — for one of those pilgrimages, perhaps, to the Holy Land or the Eternal City — or for one of our conferences. Or even simply in the pages of Reasons to Believe! I want you to feel the joy I feel this February and every February. It’s a feeling of homecoming to the household of God, to a house built on a Rock. Our Lord has not left us orphans. He would not leave us “sheep without a shepherd.” He would not leave us to live in confusion, division, or uncertainty about what to believe or how to live. He has welcomed us into his holy family, and in that family we have a Holy Father. For all the folks at the St. Paul Center, I thank you for your prayers, sacrifices, encouragement, and contributions. You make our work possible, and you make it a joy.